Hi, im trying to download the plugin, from the plugin library and uploading the file. Neither of the two could achieve it! Could not install plugin, unknown error. I would love to use AstroPrint, so if it has a solution, that will be awesome! I currently uploaded octoprint from 1.3.8 to 1.3.10 in both gives me error. And im using a raspberrry pi B. You seem to have a problem installing Pillow with pip. Perhaps some dependencies. Maybe you can try to install that in the command line first. Hi Daniel , thanks for the fast answer!! I upgraded pip and could install AstroPrint Plugin (for octoprint) good. The problem is that doesn’t appear the tab neither in the home page of my octoprint or my plugins menu. If you could hel me it will be awesome!! 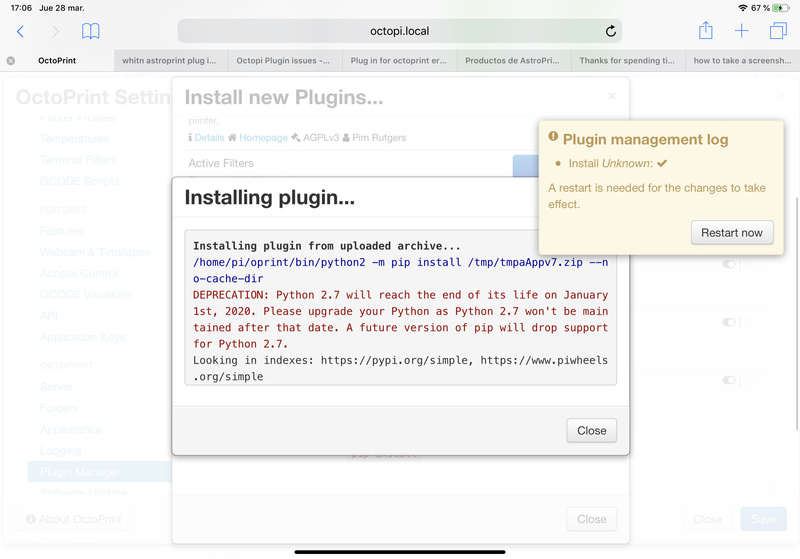 DEPRECATION: Python 2.7 will reach the end of its life on January 1st, 2020. Please upgrade your Python as Python 2.7 won’t be maintained after that date. A future version of pip will drop support for Python 2.7. Is the plugin installed nonetheless? Your log ends with Done. Is there an error in the browser’s console log?